On March 29, 1516, the city council of Venice issued a decree forcing Jews to live in a closed quarter, il geto—named for the copper foundry that once occupied the area. The term stuck, and soon began its long and consequential history. 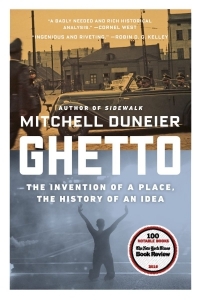 In this sweeping account, Mitchell Duneier traces the idea of the ghetto from its beginnings in the sixteenth century and its revival by the Nazis to the present day. We meet pioneering black thinkers such as Horace Cayton, a graduate student whose work on the South Side of Chicago established a new paradigm for thinking about Northern racism and black poverty in the 1940s. We learn how the psychologist Kenneth Clark subsequently linked the slum conditions in Harlem with black powerlessness in the civil rights era, and we follow the controversy over Daniel Patrick Moynihan’s report on the black family. We see how the sociologist William Julius Wilson refocused the debate on urban America as the country retreated from racially specific remedies, and how the education reformer Geoffrey Canada sought to transform the lives of inner-city children in the ghetto. By expertly resurrecting the history of the ghetto from Venice to the present, Duneier’s Ghetto provides a remarkable new understanding of an age-old concept. He concludes that if we are to understand today’s ghettos, the Jewish and black ghettos of the past should not be forgotten.